More Thrifty Finds For You! Loos-Nukka by Tanja Loumai is a complete seamless top-down cardigan which uses the contiguous-method developed by Susie Myers. The cardigan is a little bit fitted and designed with no ease. If you want a looser fitting choose one size more. Sizes available are XS (S, M, L, XL, XXL). Tanha Loumai is offering this pretty cardigan free until 23rd March 2014, no coupon needed. Sheepy is wearing his orange wool to celebrate! 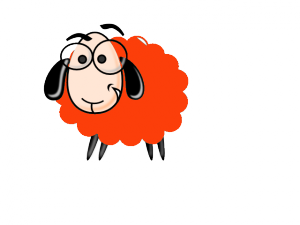 Click on Sheepy to go to Ravelry and get your pattern. And here we have a beautiful stole by Michael Dworjan called Beetles and Combs. This stole pattern uses a bulky weight yarn to create a reversible garment that features lace on one side and cables on the other. Michael Dworjan is offering this lovely pattern free until 31 March, 2014 midnight EST. Sheepy has donned his purple fleece in celebration of this one! 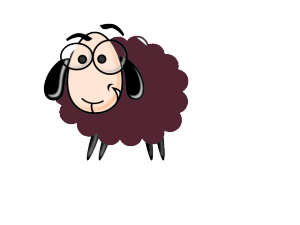 Simply click on Sheepy and you will be taken to Ravelry, click Buy Now, then click apply coupon.. and then get your needles and yarn out to start knitting!